Since the 2010 Consumer Goods Forum Deforestation Resolution, more than 473 companies have made commitments to eliminate deforestation from their supply chains. With 70% of deforestation linked to the production of agricultural commodities, these pledges hold the promise of making a major contribution to the end of tropical deforestation. 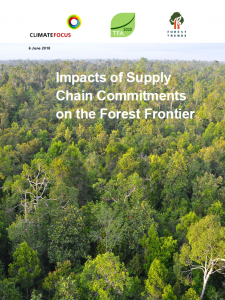 This raises two questions: 1) What is the current state of these supply chain efforts; and 2) Are they having an impact on land-use choices at the forest frontier?